There’s always been a number of custom hacks and tweaks for jailbroken Kindle ereaders (like screensaver and font hacks), but ever since Amazon released their latest line of Kindles last fall, jailbreaking has become pretty much impossible. Amazon has gone to great lengths to block any kind of hacking to the Kindle Voyage, the entry-level Kindle (Amazon refers to it as the 7th gen Kindle), and Kindle Paperwhite 2. The Kindle Paperwhite used to be part of the jailbreaking fun, but now the only way to jailbreak it is if you happen to get lucky and find one with older firmware installed. Jailbreaking has come to a complete stop ever since Amazon released firmware version 5.6.0 for the Voyage, Paperwhite, and $79 Kindle. If your Kindle is running older software from 5.0 to 5.4.4.2 you can still jailbreak it, but make sure it doesn’t auto-update beforehand. Then use the BackDoor Lock hack to prevent updates. If you have a jailbroken Kindle Paperwhite 2, the 5.6.x update will mess things up, but the device will still remain jailbroken. You’ll just have to set most things up again. Amazon attempting to thwart making modifications to Kindles is nothing new. But this time they apparently have gotten really good at it. Usually someone finds a workaround eventually, but it’s been many months and still nothing has come up other than a complicated serial port hack that’s too advanced for most advanced users. So far the only way to jailbreak a newer Kindle running firmware 5.6.x is to take the device apart, connect a serial cable, get the password, install USBnetworking snapshot, and go from there. Yeah, piece of cake. 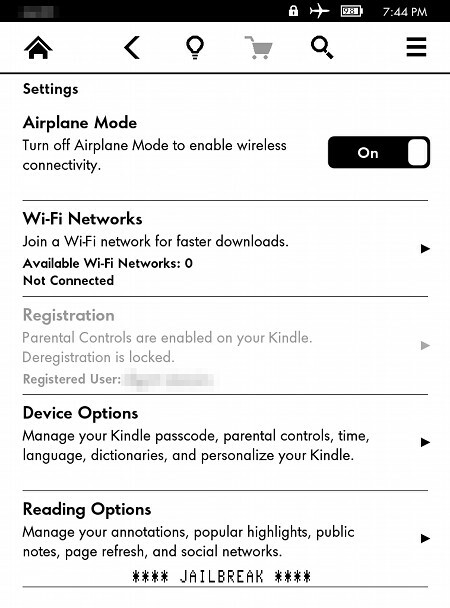 Here are the directions at MobileRead: How-to obtain root access of New Basic Kindle (2014) FW5.6.0.1. If you still have a jailbroken Kindle Paperwhite 2 with older firmware, you might want to block updates from happening to avoid the 5.6.x software. See the Kindle BackDoorLock hack for directions. So … can’t jailbreak a kindle and can’t buy a late-model Kobo (or anything else other than a very outdated, very bad Nook)in America. Since it’s hard to believe that any company is negligently ignoring the United States, there *must* be a reason that these other brands aren’t available here and it has gotta have something to do with Amazon paying them off. It is pretty much official that E-Reader innovation is for the rest of the world, not America save for the whims of Jeff Bezos. The crazy thing is that Amazon, after 20+ years of life, is still looking for its *first* penny in profit. You have to wonder how a profit-less company can have so much power — let alone stay in business — don’t you? For me, only two things are good about Kindle: the possibility to password-protect the device, in case you don’t others to look into your content, if you lose or forget your Kindle somewhere and the screen quality. What about the whole other features? Well, other readers offer better book organisation such as Kobo and Nook which do not depend on an account for the creation of book collections or categories, such as the Bookshelf feature of Kobo. I stopped using Kindle when I discovered that I couldn’t use my own favourite foreign language dictionaries anymore. I am currently using a Kobo Glo and don’t need to bother with “jailbreaking” it. A jailbreak for the 7th generation devices (and the 6th generation Paperwhite) running firmware 5.6.5 was released at the mobileread web-site 2/5/2016. Thanks! Funny timing. I just noticed earlier today. If I can get it to work I’ll post an easy how to tutorial and video later this week. I’ll have to figure out how to roll back to 5.6.5 first though. Jailbreak link, for those interested. Software Jailbreak for PW2, PW3(B), PW3W, KT2, KT3(B), KT3W, KV, and KOA.